I love poetry, but I hide it like a teenager with acne because poetry is so unloved. Unloved, unread, unmonetary, and much, unreadable. Because everyone’s a poet. So it gets a bad rep.
That or poetry is hidden tightly in elite circles who define the taste of poetry like secret chefs, except the result is circles of expression closing tighter and tighter. So, yes, there is bad poetry. Sorry. There just is. Yes, there is stratospheric poetry because some of the icons of the medium are icons for good reason. They can take you with words to places you can’t even fathom. One lilt from their pen and you are swooning in prosody. Then there is literary poetry. Defined as the definition of good poetry, literary poetry is, sorry to say it, mostly dry. Technically proficient in those ever closing circles of judgement, but as dry as the dust in the corner of your closet. That’s why when someone comes along who is technically proficient and makes us care, we ooh and ahh. But it shouldn’t be that hard. It wasn’t back in the time of great poets. We have poet laureates, but who of those will be remembered as say a Rimbaud, or a Borges? But I’m here to write about my poetry. My poetry does not meet modern literary standards (though my future poetry might, considering Claudia Rankine’s stream of consciousness-like book, meaning some writing is still open for judgement.) My poetry is not bad (sorry bad poetry writers, but there is a difference.) Neither is my poetry of “literary” quality. First, I did not get an MFA and carefully create literary alliances as necessary. But mostly it’s because my rhythmic structure (in most poems, though I write a large variety of types) relies on assonance. I fell in love with the sound of language and literary rules told me that informal rhymes are the plague. I write both rhyming and free verse, by the way, but I have to tell you, when I read some of the past greats formal rhyming structure I hold back a gag. Of course, that could be why they are out of style now. Anywho, I love the flow of words and the flow of the sound. Assonance to me carries me over and through ocean tides. So many of my poems rely on it. Other of my poems are like stakes through the heart. They hit you and you can’t breathe. Those are my kind of readers. 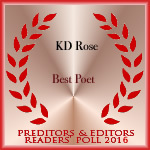 Readers that want an experience when they read poetry. Readers that want to be moved in some way by what they read. Or even left going, “Oh my god, what the hell was that?” To me, poetry sings when it is able to do this. I write other kinds too. After all, I am a writer and the writing takes me where it takes me, but be very clear: I slave over ever line and word in my poems until there can be no more and I have to release it. So everything there is damn well meant to be there. Period. I chose this relatively at random. From Heavy Bags of Soul. See if you can sleep. Did you ever know what for? Pretend that sleep will come. You’re so graceful when you run.